If you’re like most Hawaii travelers, you’ll probably want to remember your amazing Hawaii vacation. Or, maybe you have lots of loved ones at home who are hoping for a gift from paradise. Either way, you’ll want to do some shopping while you’re here in the islands. On today’s podcast we give you some ideas and share our favorites. But, you want to be careful about what you bring home. After all, you don’t have a lot of available luggage space! 1. 100% Kona Coffee: Every time my Mom comes to visit, she makes a b-line for the nearest store, so she can stock-up on 100% Kona Coffee. I don’t drink coffee, but according to her, there’s absolutely NOTHING like it! Yes, you can order it on Amazon or pick some up at Costco in Hawaii, but to get the good stuff, go local. If you happen to be visiting the Big Island, take an excursion like the Big Island Circle Tour through Hawaii Aloha Travel. During your trip, you’ll visit the coffee fields of Royal Kona Coffee, and you can purchase some there. 2. Chocolate Covered Macadamia Nuts: If you try to come home after your Hawaii vacation WITHOUT at least ten packs of Chocolate Covered Macadamia Nuts, run for cover! The loved-ones you left behind may be pretty angry! The good news? 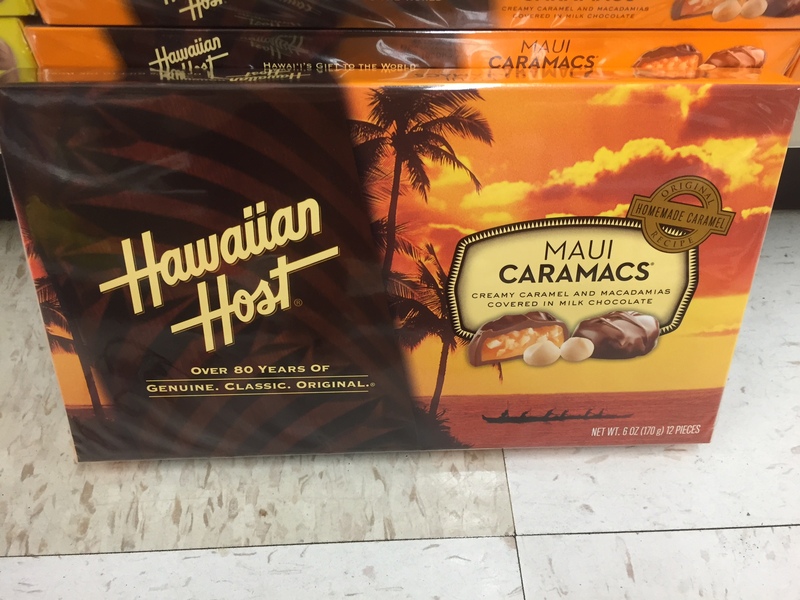 You can find boxes of these delicious chocolates just about anywhere in Hawaii (Costco, Longs, Wal Mart, Walgreens, Target). The bad news? Now, you’ll find all sorts of variations on the original, which may make your job of choosing which ones to buy a little harder. 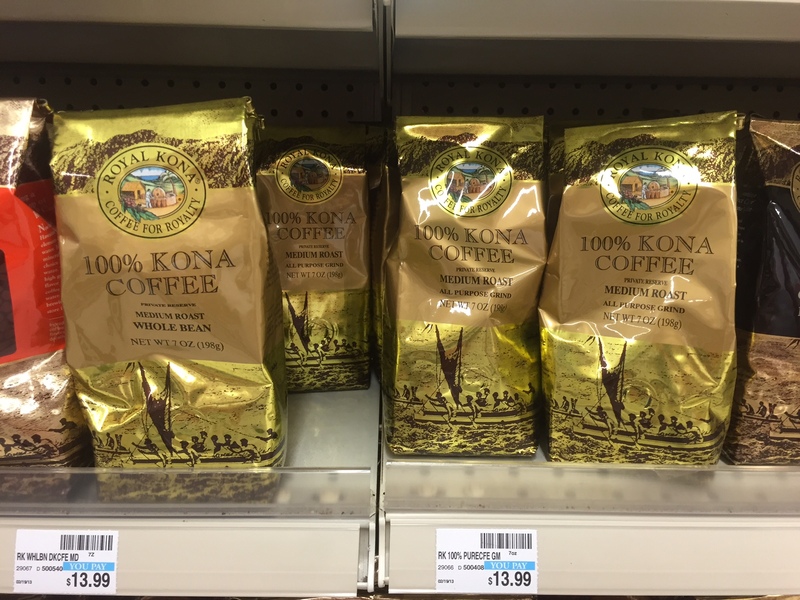 100% Kona coffee can be found at various retailers in Hawaii. Just make sure to read "100% Kona Coffee" on the label. 3. Local Art: Hawaii boasts some of the most eclectic and talented artists in the world, and you can find all sorts of one-of-a-kind pieces of art here. One of my all-time favorite gifts is part of a roof tile from the oldest church in Hawaii. On it, an artist carved an ancient Hawaiian “family” symbol. Now tell me–where else can you find something like that? Check-out the Naturally Hawaiian Gallery in Waimanalo for some really unique island treasures. Scrimshaw and Koa wood art is especially beautiful. But, beware: Koa wood is expensive! 4. Portuguese Sausage: I’ve recently become a portuguese sausage addict — and I’m loving it! You can find portuguese sausage links in any of the major grocery stores, plus Longs, Walgreens, Wal Mart, and Target. Portuguese sausage is an island staple, even if it is a bit fatty. My favorite brand is Hawaiian Brand Portuguese Sausage. One online writer says to freeze the links prior to flying-out. Then, they’re still cool when you arrive home. Yes, they sell it on the mainland. But, I’ve heard it’s not nearly as good as what you can find here. If you want to bring back some Hawaiian treats for the loved ones at home, chocolate covered macadamia nuts are an affordable option. 5. Coconut Postcards: You may not believe this, but it’s possible to mail a coconut postcard from Hawaii. In Hoolehua, Molokai, you can even pick-up a coconut at the local Post Office (for free) and decorate it there. The average cost to mail on is $11 to $16. In theory, any Post Office should mail one, but those in Hawaii are more used to it. Just find a dried-out coconut, decorate it, and find room for a mailing label. I can’t promise every Post Office will accept it, but it’s worth a try! Empty luggage space is a precious commodity, and so is your hard-earned money. Don’t waste either. So, consider our picks when you’re thinking about what to buy when in Hawaii.